Help put the dead to rest at Vivec's Antlers. Anoint nine remains near Vivec's Antlers. Priestess Brela is aboard a ship near Vivec's Antlers. She was captured while anointing the bones of Dunmer who died fighting the Akaviri. You make a deal with her: you will anoint any remains you see, and she will leave the ship. Ghostly Remnant: "Legions of Akaviri invaded our shores." Ghostly Remnant: "They came, killing and burning, though we never knew why." Ghostly Remnant: "I died as the flood came. It swept them all away." Ghostly Remnant: "Die, Akaviri! Die!" Ghostly Remnant: "The waters took friend and foe alike." Ghostly Remnant: "The tides rolled in, crushing all in their path." 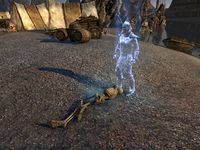 Ghostly Remnant: "The Akaviri were defeated, but at what cost?" Once all nine remains have been anointed, you need to talk to Priestess Brela. She is east of Vivec's Antlers and north of the wayshrine. She thanks you for anointing Vivec's children and gives you the Gauntlets of the Akaviri War and gold.